A marine biologist and leading researcher of North Atlantic right whales has declared 2016 a banner year for the beleaguered Bay of Fundy. Moira Brown, a senior scientist with the New England Aquarium and the Canadian Whale Institute, has been studying whales for more than three decades and says after five years of desert-like conditions, an unexpected richness and diversity of sea-life has returned to the bay. "Last year we documented eight right whales during our surveys. This year it was just wonderful, we're up over 70 individual right whales for the season. And not only that, but we were getting repeat sightings, and we were getting new whales coming in every survey. It really seemed like the bay was far more alive." Brown was speaking at the end of a research season during which scientists were surprised by a resurgence in the right whale population. "Really the last five years when we've been out doing our surveys, it has felt like a desert out there. And this year it was much more alive, far more diversity," says Brown. A feature conversation with Dr. Moria Brown about her lifetime studying the North Atlantic Right Whale. Harry Forestell speaks with her about her on-going fascination with these remarkable creatures. 26:10"Speaking with the fishermen there's been more herring around than there has been for several years. And certainly the bird life as well. And more numbers of whales, more finbacks, more humpbacks, more right whales." Since 1985 the marine biologist has been studying the population of endangered North Atlantic right whales that visit the Bay of Fundy in search of the nourishing blooms of plankton in the deep waters off Grand Manan. The plankton are swept into the bay by strong currents from the Gulf of Maine — "like clouds moving across the sky" says Brown — with hungry right whales and their newborn calves in pursuit. But changing conditions in the marine environment, from depleted levels of plankton, to rapidly warming waters in the Gulf of Maine, to human activity on the water, may be causing tremendous variability in the whales' activity. Over a 36-year period, in their worst year researchers surveyed just five right whales and in their best year, 215. The total population is thought to number about 500 individual animals. "Right whales are our canary in the coal mine," says Brown. "And when I see right whales here and I see them staying here, that implies to me that the food chain is working the way we expect. When you see multi-species diversity and see it over several months and you speak to the fishermen and they're seeing increasing numbers of fish compared to the previous five years, then it implies to us that, yeah, the Bay of Fundy is having a good productive year." 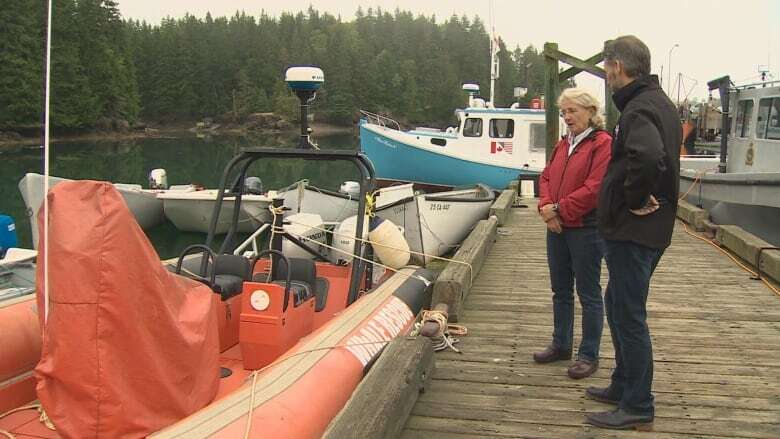 Moira Brown says there have been more documented sightings of North Atlantic right whales in the Bay of Fundy this year than in recent years. (Courtesy: New England Aquarium)Brown is a force of nature in her own right. The 61-year-old Montrealer coaxed and cajoled shipping companies to alter their routes through the Bay of Fundy in the 1990s, moving tanker and container traffic away from the rich right whale feeding grounds near the Grand Manan basin to avoid collisions with marine mammals, a campaign that has all but eliminated whale strikes in the bay. Asked if she is fearful of a resurgence of collisions if tanker traffic increases with the proposed Energy East pipeline project, Brown is remarkably sanguine. "Shipping traffic really has fallen off since about 2003 and is lower now than it was when we moved the lanes. So with the proposed increase in traffic we would get back to about 2003 levels. "We maintain an open dialogue with all the different aspects of the shipping industry, tankers, containers, through the shipping agents up in SJ. I'm confident that if we are concerned there is additional risk for right whales, that we would be able to speak with them about it to see what other measures would be available to address it." A bigger worry for Brown and her colleagues is the frequent entanglement of right whales in fishing gear. On several occasions this summer she accompanied the whale rescue team she helped found to free animals trapped in coils of crippling rope, encumbered with floats and doomed to die without human assistance. Moira Brown helped found a whale rescue team to try and free whales that become entangled in fishing gear. (CBC)From a precarious perch in the bow of a Zodiac, Brown directed a team of fishermen through delicate manoeuvers to cut away the heavy ropes that often slice deep into the flesh of the distressed animals. It is a problem that has so far stumped scientists and fishermen alike. "Colleagues in the States have been working for over 20 years to try and figure out how gear can be modified to reduce the risk of entangling right whales and other species of whale as well. There is no magic bullet. "As the whales move around we need to keep addressing it and we also need to keep working with the fishermen because someone will have a good idea. It is a really difficult problem and we haven't found a solution yet that we can apply broadly to address that problem." Aside from negotiating measures to protect the endangered right whales, Brown is still trying to unravel mysteries that continue to confound marine mammal researchers. From a research station in Lubec, Maine and her home on Campobello Island, Brown directs research teams in the Bay of Fundy and this summer in the Gulf of St. Lawrence, where they've recently found a new gathering place for right whales off the Gaspe Peninsula. Where they've come from and how long the whales will stay is unclear. Even after 30 years of studying these massive but fragile creatures, Brown has more questions than answers. "The bottom line is these whales still have a lot to teach us. They are still a pretty good mystery. The three burning questions that were being asked 30 years ago we still haven't really answered. Where is the second summer nursery? Where's the mating ground? And where do these animals go in the winter time other than the mother-calf pairs down in Florida?" Moira Brown chats with middle school students on the Campobello Island wharf. 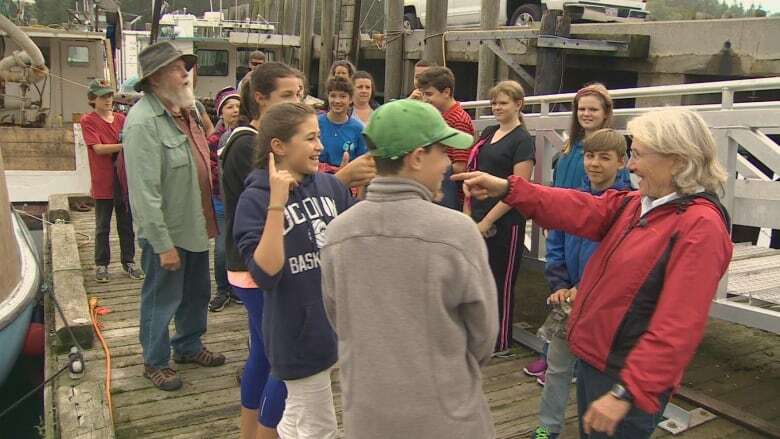 (CBC)As we talk on the Campobello Island wharf surrounded by brightly-coloured fishing boats, a crowd of local middle school students comes tromping down the ramp to board a whale watch boat. They all know Brown and her exploits. Asked by their teacher "What has Moe Brown done? ", they shout in unison "Shipping lanes!" It is a recognition that clearly pleases Brown, who smiles broadly and promises to talk to the students when they return to shore. After all, they are the next generation of researchers, fishermen, ship's captains and politicians. The more they know about the bay and the creatures that live in it, the better the chances of survival for the North Atlantic right whale — something about which on this day, Brown is clearly optimistic. "When you think about all the attractions to the Bay of Fundy, the whales, the seabirds and the people who love to come out and watch these animals in their natural habitat, it was encouraging this summer to see a Bay of Fundy that was so alive again. I think everybody was excited about it. I hope I can say the same thing next year." 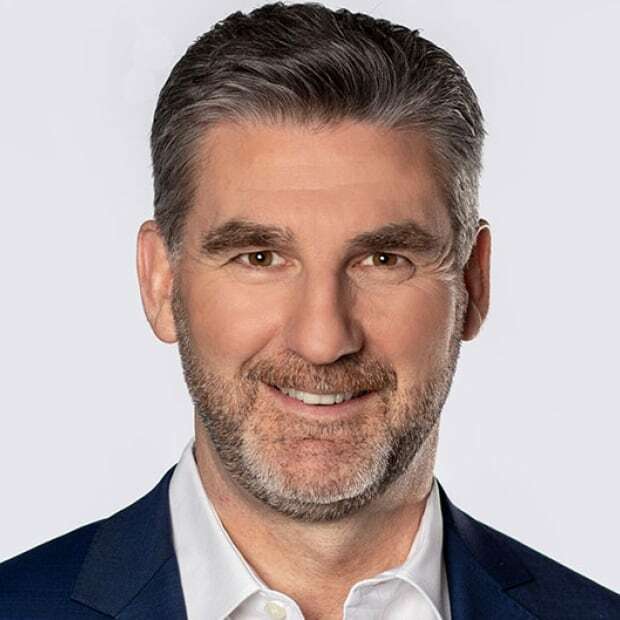 Harry Forestell is the host of CBC News New Brunswick at 6. He worked in London as journalist from 1995 to 2000 and from 2005 to 2008 as CBC's European correspondent for Newsworld.